Wait! Before you hit the back button just hear me out. 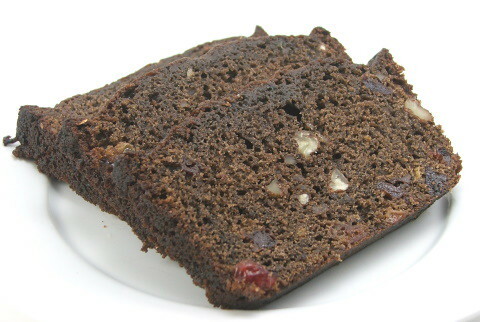 I know fruit cake gets a bad rap, and most of the time it is well deserved. 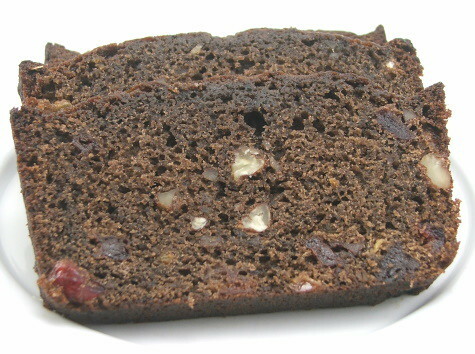 Be it the candied citron, the fluorescent cherries, or insipidly sweet cake, most fruit cake is in fact very bad. Terrible even. 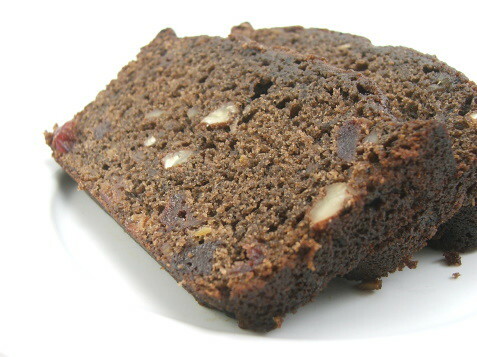 I’m still asking you to hear me out, because I have created a recipe for fruit cake that is more than edible, it is actually good! My husband and I hate fruit cake, and we BOTH went back for seconds. Really. So, how did I make a good fruit cake? 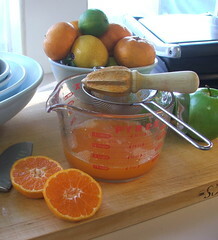 I started with fresh orange juice and zest rather than candied citron. 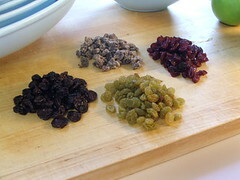 I used the juice to soak a mixture of dried fruit, which replaces the candied fruits, to add moisture and extra flavor. I also used a higher cake to fruit ratio. Sepaking of the cake, I used some cocoa powder in the cake for color and flavor. The subtle cocoa flavor work so well with the orange, and the rich color appeals to me. This cake uses far less molasses than a traditional recipe calls for. 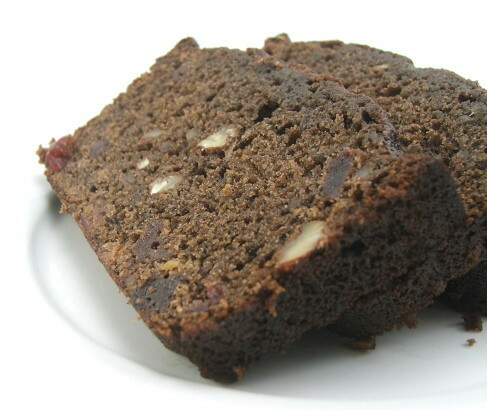 I find the molasses overpowering in most fruit cakes. Mine uses only two tablespoons. After soaking the cake with whiskey or bourbon and letting it set well wrapped in plastic for a few days it is ready to eat. If you are making this in advance for Christmas you can brush a little more whiskey or bourbon on the cake a couple of times a week until ready to serve. It will only improve the flavor. Heat the oven to 350 F and spray two 8″ loaf pans with non-stick spray. Juice enough oranges to yield two cups of juice. 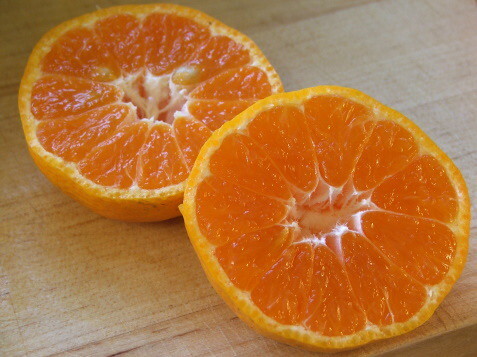 Heat the juice in the microwave for two minutes, or until very hot and steamy. 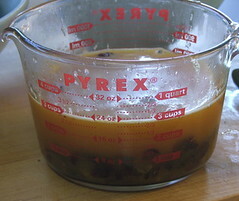 Place the dried cherries, cranberries, dates, and golden raisins in the hot juice and let soak for fifteen minutes. Drain the fruit, reserving 1/2 cup of the soaking liquid. 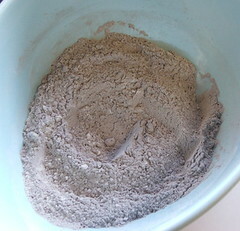 Sift together the cocoa, flour, baking soda, baking powder, spices, and salt. 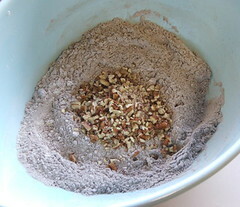 To the sifted dry ingredients add the chopped pecans and candied ginger. In a separate bowl combine the eggs, orange zest, both sugars, golden syrup, molasses, vanilla, and butter. 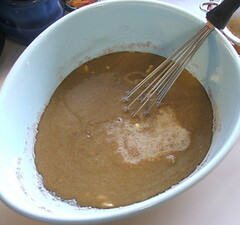 Whisk in the 1/2 cup of the reserved soaking liquid. Pour the wet ingredients into the dry and whisk gently to combine. 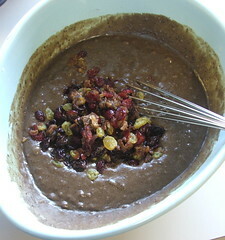 Add the soaked fruit and incorporate evenly into the batter. Divide the batter evenly between the prepared pans and bake for 40 – 50 minutes, or until the cake pulls away from the sides of the pan and springs back when gently pressed in the center. Cool the cakes ten minutes, then brush over the top of each cake two tablespoons of either whiskey or bourbon. 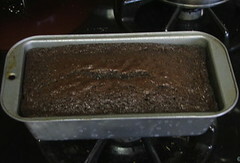 Let the cakes cool completely, then turn out and brush the bottom of the cakes with the remaining whiskey or bourbon. Wrap well in two layers of plastic, then place in a zip top bag and let stand two days at room temperature. At this point you can serve the cake, or if you choose you can brush the cake with an additional tablespoon or two of whiskey or bourbon twice a week until you are ready to serve. Check out In Jennie’s Kitchen to see the 12 Days of Cookies!